A proximity sensor placed near the mold cavity detects when the mold opens and signals the unit to deliver mold release. Nozzles can either be attached with brackets (included) or optional magnetic mounting blocks. You are free to position them anywhere to deliver spray to any point, such as trouble spots in the cavity, the entire face of the mold, both mold cavities, or even to create a "cloud" of spray between the cavities. The compact control unit has protective rubber feet so it can sit on any flat surface, or it can mount directly to the machine and it can be plugged into any 120v 15 amp outlet. The freedom unit comes complete with the easy-to-program control unit, 10' premium spray hose and two spray nozzles, a proximity sensor with a 6' sensor cord & 5' tank hose, with 10-ft power cord. 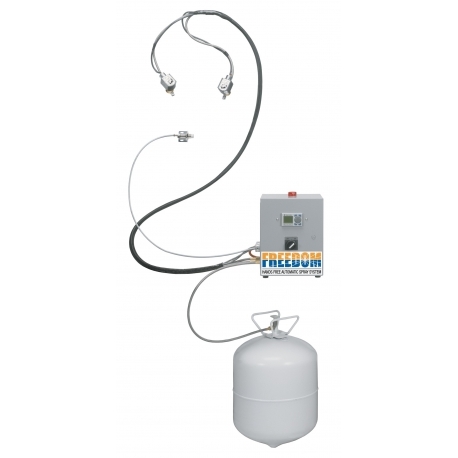 How to use the simple Plug & Play Freedom Automatic Spray Unit. Visit Slide Instructional Videos page for more "How To" videos.